Take the cookies and break them into small pieces. Cut walnuts or pecans into small pieces. In a small, non-stick pot add cocoa and sugar and mix together. Add egg and melted butter. Simmer the mixture on low heat for 3-4 minutes, add the crushed cookies and nuts, mix well. The mixture should be thick. Take parchment paper, and cut into a rectangle, just enough for the mixture to fit. Take a piece of butter and rub the top of the parchment paper (this prevents the mixture from sticking to the paper). Add the mixture from the pot on to the parchment paper and roll it in the form of a sausage. Twist the ends so that it holds its shape. Refrigerate for 2-3 hours before serving. Once ready to serve, slice it like salami and enjoy! I'm made an Italian version, almost identical, but additionally contained raisins, candied fruit, etc. I'm sure this recipe has to be good! Thanks for sharing. I've read they serve a small slice on a plate, often with some whipped cream for dessert. But it's good to eat a slice like candy, too. I spend time at another foodie forum, Marlin- and yours looks every bit as lovely as "mama Sophia's" does from that forum! 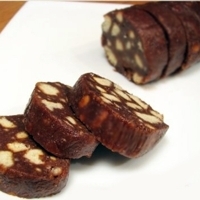 I love this sweet salami! Thanks for sharing! I am not a very sweet tooth but seeing this recipe makes me want to try it. I'm definitely sure it will get good reviews from my kid. vanilla cookies? Nilla wafers or animal crackers? Thanks Marlin. Yes, my grandma used to make it this way. I am sure there are thousands of different variations of this recipe :) Thanks for the review!